Your logo is what represents your business, what it does and what it stands for, this is why designing a logo for your company or brand is so important because it is the first thing that clients and partners see when they come across your business. You want your logo to be professional, unique and for it to convey your brand’s values and mission. But having a good logo for your business is not enough if it’s not presented in the right way, you will want to make your audience familiar with it by adding it to your marketing materials and overall business presentations, you will want to make your logo your brand’s personality. Why Do I Need a Logo Animation For My Business? ✓ Intro/Outro for YouTube videos. Build brand recognition by initiating or finishing your tutorial, corporate or marketing videos with none other than your logo in an animated format. ✓ Business presentations. Let’s say you are presenting a new project to the board, you will want to finish it with an animated logo that will make it come across as sharp and professional. ✓ Pitch videos. Looking for investors or partners? Making pitch videos can be a hassle, close them with a striking logo animation to really convey seriousness and make them want to do business with your brand. ✓ Social Media Content. Your social profiles are the best places to build brand recognition, use them to showcase your logo animation and get your followers familiar with it. Sites like Instagram are all about media content, use your animated logo as an outro for your videos – or even photo carousels to grab the attention of new audiences. ✓ Your Website. Replace your static logo with a logo animation to increase brand awareness. Just check out how amazing a business logo looks like when animated. 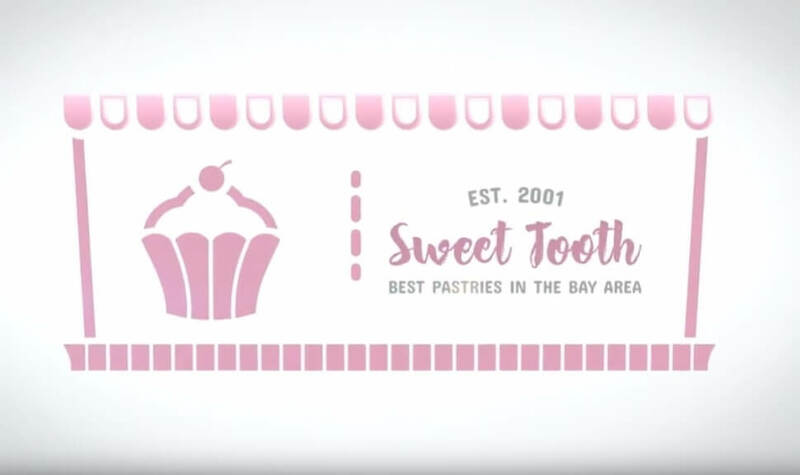 This is the logo for Sweet Tooth, a fictional bakery in the Bay Area, and when displayed using a logo animation template… it just comes to life! How Do I Make an Animated Logo? Want to make an animated logo to use for the applications mentioned above? There are several paths you can go by. In this post I will go over three different options so you can choose the one that best adjusts to your budget, calendar and design expertise. One of the easiest ways to make a logo animation is to hire a designer or animator to do this, if your company has an art or design department you can simply commission this to them, if not you can always search online for a freelance designer who will take care of this task for you. Sites like Fiverr or Upwork allow you to hire a qualified designer to animate your brand’s logo into a clip you can add to your YouTube video, presentations of social media content. Here’s what you can do to make an animated logo with an outsourced designer. NOTE: I chose Fiverr since I’ve worked with designers from this place in the past and I’ve had good results. You will get a screen like the one below with different results from lots of artists and designers, browse through them to see their work and select one whose style matches what you are looking to create for your business (and your budget!). TIP: Below the search bar you will see some related search terms, you can use those to browse other types of services that can be more specific to what you need. Each designer will have a different work method and schedule, make sure you read the reviews before hiring someone. Another thing you can take into account is the number of orders in the queue as this can say a lot about the designer, his demand, availability and overall professionalism. Be careful when hiring people on Fiverr, keep in mind the Internet is a huge place that holds all sorts of people with all sorts of intentions, there have been cases of people purchasing logo designs from freelancers on Fiverr only to later find out that these have been previously registered. I suggest you read the reviews of each designer before hiring them or using the designs they deliver for your own business to make sure you are acquiring an original logo design or animation. If you don’t have the budget to hire a designer and you’re feeling a bit experimental you might want to try creating and animating your logo on your own. Like many DIY paths, this may seem like the cheapest way to go, but don’t let yourself be fooled, using complex editing software like After Effects is no easy or cheap endeavor. ✓ Your logo. The required format is PNG with transparent background. ✓ Adobe After Effects. The monthly subscription just for this program is $19.99, and $49.99 for the whole Adobe Creative Cloud. You can download Adobe After Effects here and get 1-month free trial. ✓ Editing and animation skills. Think Photoshop is complicated? Wait until you open up AE, this is a program that can be used to create amazing animations and graphics, but if you are not familiar with the tools and the commands it can be overwhelming. Here’s a really good tutorial from the Adobe team on how to use After Effects to make basic animations of your logo; you might want to check it out as it covers the entire process. One of Placeit’s goals is to make beautiful design and marketing assets available to everyone, regardless of their design skills or knowledge. Making a logo animation to display your logo in an innovative way is now super easy thanks to Placeit’s logo animation templates. Step #2 Upload your image to the template and… that’s it! Really. All you need to do is click the upload button and see for yourself how awesome your logo looks when animated. These logo animation videos are 100% free on a small size, that is 640 x 360px with a Placeit watermark, these can come in real handy if you are looking to make a preview for the team before committing to download the real deal. The high-res video is 1920 x 1080px and it only costs $29! Animating a sports logo is a great way to make it stand out and steal the spotlight, like this logo for the Rocky Raccoons, a fictional basketball team. So there you have it! Don’t get intimidated by the professional look of an animated logo, these are actually easy to achieve once you find the right tools or team of people to help you out. Hope this post was helpful to you and you can now make a logo animation to display your business or brand’s logo like the pros. Ready to take your brand to the next level with an animated logo that conveys professionalism? Brand your account using Placeit’s Instagram Logo Maker to make fantastic designs and gain more followers! There are tons of different logo styles. Read this guide on how to create a logo easily using Placeit’s logo maker tool. Follow these simple steps and make your own logo in just a few clicks. Now on Placeit once you create your logo not only you download a hi-resolution PNG file but also a PDF file with your vector format logo. Dive into This Incredible Swimming Logo Maker! This is the perfect tool to create a Swimming Logo for your swimming school, your swimming team or if you are about to design your swimwear line. Dive in! Make a professional logo with the right tool. You can design your own golf logo in just a few clicks. Make amazing images for your golf club today!